None of us enjoys thinking about what would happen if we were thrown into an emergency situation. Real life questions such as “how will the hospital know that I take blood pressure medicine?” or “will my current medication interact with any emergency medications they prescribe me?” remind us that we need to take emergency precautions. You can do this by entering information into a customizable, fill-in-the-blank medication log template. The medication log template is essential when crisis strikes. 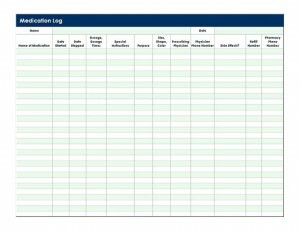 By taking the time to fill out the easy-to-use medication log template, you are ensuring your safety. The template is customizable, allowing each family member to list his or her medications. It is also free and available for download from this website. Set aside some time to gather all the bottles and boxes of prescription and non-prescription medication you take each day (Remember your vitamins and supplements!). You will want to write down the name of the medication; date started and ended; dosage and how often you take it; the medication’s purpose; the size, shape, and color of the medication, the prescribing physician and his or her phone number, the refill number, and the pharmacy’s phone number. If you have trouble collecting this information, contact your prescribing physician or pharmacist. Next, take some time to think about each medication’s side effects. Write this down. Also, write down if each specific medication has any special instructions (can’t be taken with certain other medications or can only be taken with food, etc.). Now, fill in all the information you gathered earlier. To do this, you should erase the template’s information and type yours in. First, make sure you update this often. Remember to add additional medications that may be prescribed. The form is only as good as the information it contains. Next, bring it to all doctor’s appointments, so everyone is aware of what medications you take. Finally, print off plenty of copies. Place them in your house, in your vehicle, and at work. Also, give to a trusted friend outside of the family in case an emergency comes up. You never know when disaster will strike. Keep yourself and your loved ones safe by downloading this template found at myexceltemplates.com.